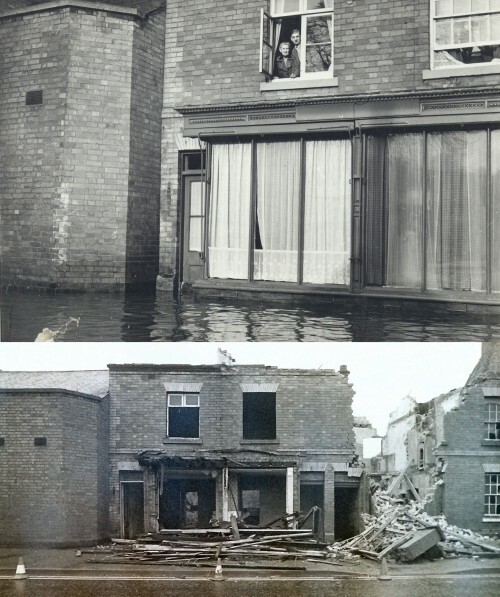 The top photograph was taken during floods in the 1960s and appeared in the Leicester Mercury. It shows Harry and Ada Yeomans avoiding getting their feet wet at their home on Leicester Road. The shop was just opposite the entrance to Hall Leys (about where Weavers Close is), and the lower picture shows it being demolished in 1977. Ada sent the picture of her and Harry to her sister-in-law Fanny, who along with her husband William (Ada's brother), had emigrated to Canada in February 1912. Ada was born Ada Bagley in Quorn in 1889. She married John Henry Pick in 1915, who was sadly killed during WW1. She then married Henry Yeomans (known as Harry), in May 1922 and they lived in Quorn for all their married lives. Harry died in 1968 aged 79 and Ada died two years later in 1970 aged 80.